See the sights, grab a bite and get loud with friends while enjoying gameday action. The Estrella Jalisco Party Pass provides exclusive access to two (2) standing view locations and experiences at Marlins Park with one (1) party pass wristband. Both locations are on the Promenade Level and allow pass holders to socialize with family and friends, eat & drink, and watch the action on the field from each unique vantage point. Party Pass holders are permitted to move back and forth throughout the game between the two exclusive destinations - The Social presented by Estrella Jalisco and AutoNation Alley. The Social: Estrella Jalisco is a standing view experience located in the foul territory corner of right field. 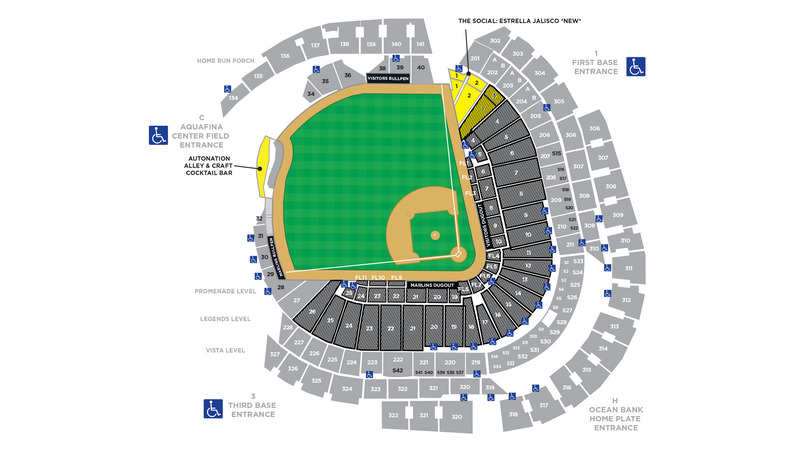 Its location within Sections 1-3 provides an exclusive access gathering spot for Estrella Jalisco Party Pass holders with a redesigned in-section view of the game from five tiered drink rails. AutoNation Alley, the new social area in left center field, is a tiered viewing platform structure with three primary levels. Estrella Jalisco Party Pass holders have exclusive access to the middle tier of AutoNation Alley. Once inside Marlins Park, Party Pass holders should check-in at the Estrella Jalisco branded podium at either Section One  OR behind AutoNation Alley and you will receive your party pass wristband to access the two destinations.